I can mark another project off my list now. I finished the hutch I purchased a few weeks back. Here is the before pic and honestly it was just fine the way it was but I had a different vision for it. The Hubster kindly helped me take out the top shelf because I knew I was going to want to do taller displays. The back was originally going to stay wood but one thing led to another and it got painted and distressed. Even though painting the back was not in my original vision I really like how it turned out. I really do not regret one bit knocking that shelf out. I always try and save the original hardware.They help make the piece I think. 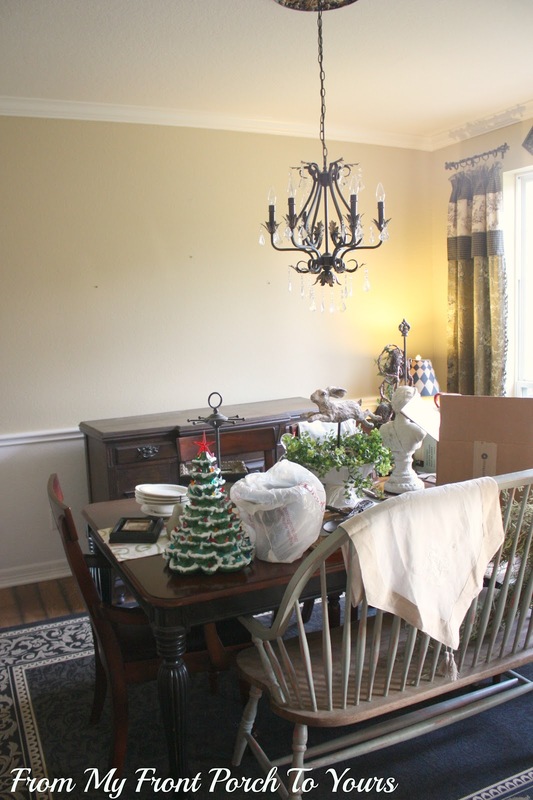 I have already started the process of taking our buffet out of the dining room to make room for the finished hutch. I will be sure to share once it is all set up. 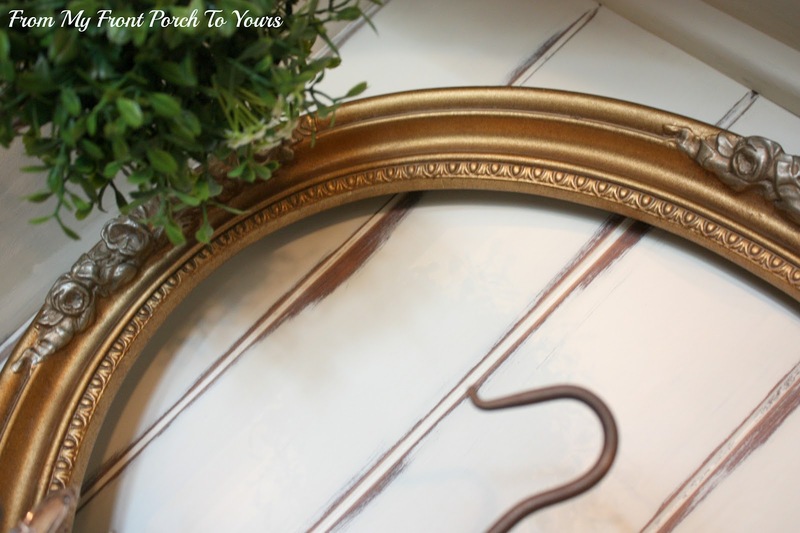 I am crossing my fingers it will look good in our dining room because I just love it! Wow, wow, wow!! It looks amazing!! I just love it! Such a pretty piece! I'm sure it was a lot of hard work, but well worth it! it is beautiful! It's going to look great in your dining room, so do you have another place for your buffet now? Pamela, it is gorgeous! You did an awesome job with this piece. Can't wait to see it in your dinning room! Beautiful! It looks great!! I love the top shelf removed! 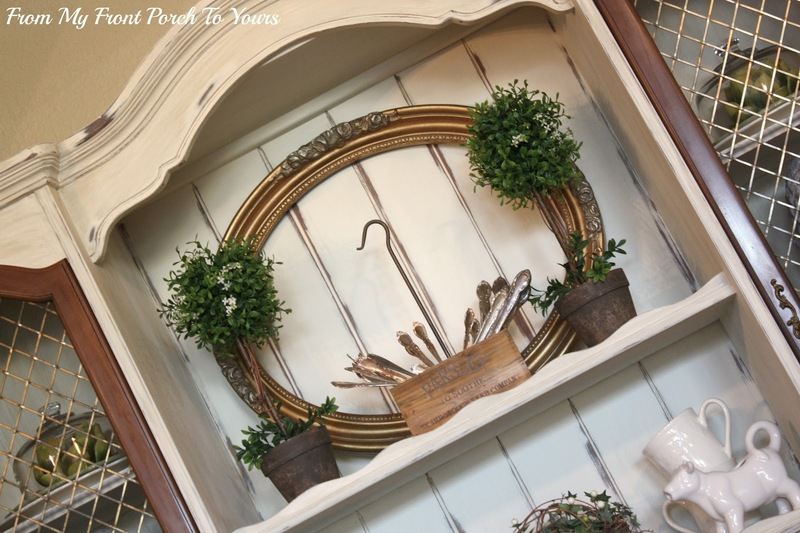 It will look so pretty in your dining room! Pam, this piece is gorgeous! It is going to look incredible in your dining room. 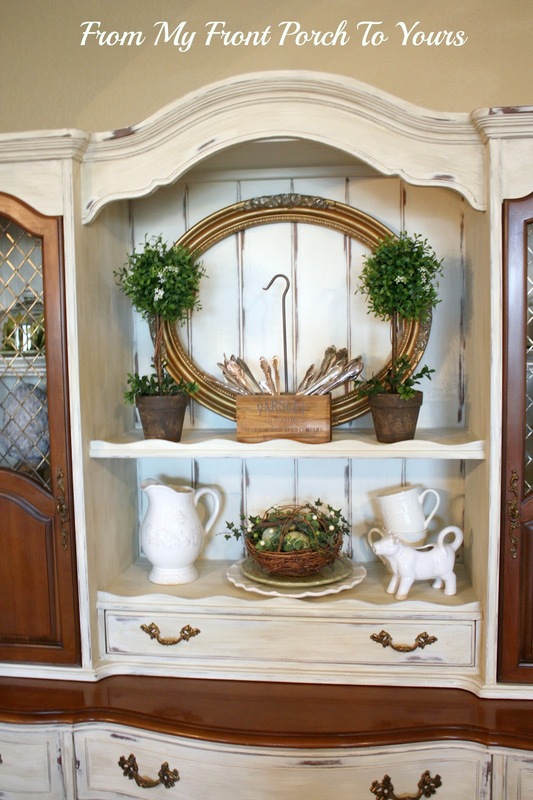 I have been thinking of adding some paint to a pine hutch that I have, and you have inspired me to add some white. It'll look great in your dining room. Looking forward to pic! It is going to look great in your dining room, Pamela! Wonderful job! I love all the display room you have. It's such a nice size, too; not too big, not too small! What a great mix of paint and wood! It's gorgeous. This is a Awesome piece and looks wonderful the way you have left the wood and painted works great together. And the way you have decorated it with your items. Wonderful job..well done. Love it! Taking out the top shelf was so smart. It is going to be beautiful in your dining room. I cannot wait to see all the different ways you are going to set this up. It is so pretty, you did a great job on it! Fantastic!! i think it would look stunning anywhere you chose to put it!! I love that you left the door stained!! This is one of the best transformation that i have ever seen!! You deserve an A ++++!! Drool, drool, drool! I love the original wood against the new white. BEAUTIFUL! so very pretty. I loved the way your styled it, and agree that removing the shelf was a smart move! All I can say is WOW. Love the transformation. this is fabulous, love love the new look, you did a super job! Don't worry...she will look stunning in her new room!!! LOVE her new look, and painting the back panel was a great choice. Thanks for sharing her at my party. I love what you have done with this piece. Just removing that one shelf was genius, it changes all the proportions. Love, love, love this! Gorgeous! Oh I am SURE it will. It's just gorgeous. I know... I need a new word! It's "kick you and run off with it" worthy? It will look fabulous in your dining room. You did an amazing job. I love the color combo you went with. Beautiful Beautiful Beautiful. It looks fabulous! Love the way you accessorized it. It's going to be beautiful in your dining room. I'd love it if you linked up at my linky party. Mod Mix Monday! You have created about the most beautiful hutch I have ever seen. I mean it! It is original, stylish, and you have decorated it so well. Nice! Pamela, it is fabulous. You did such a good job. I love the doors left in the wood tone. That will be fabulous in your dining room. I thought it was to sell. Absolutely fantastic! I know I commented on your FB page, but I had to again! Absolute perfection! Great job, Pamela! The Hutch turned out so pretty! I love the colors and how you left the top of the base and the 2 doors the original wood...and that you painted the back and aged it! That is just a breathtaking transformation! You did an amazing job! 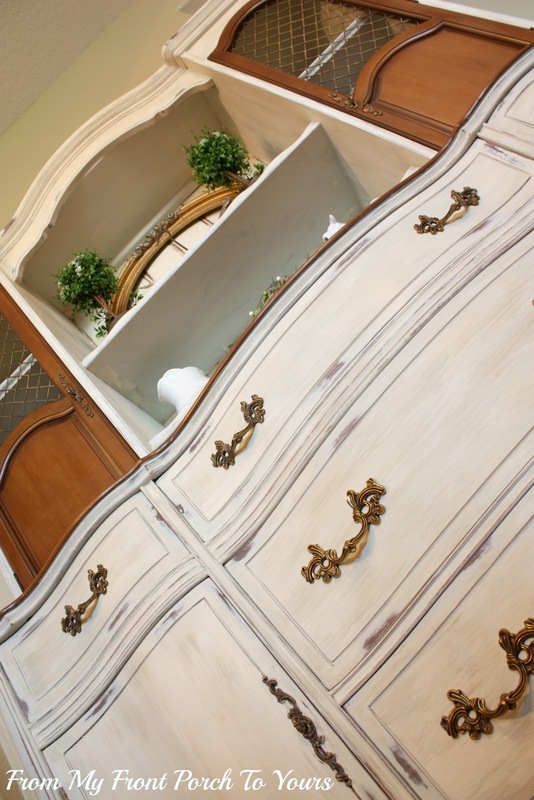 Your french hutch is super gorgeous! What a WOW transformation! Great job! Your hutch is gorgeous. Love the way you painted it, and yes, taking out that shelf was a great idea. Gives much more flexibility for displays. 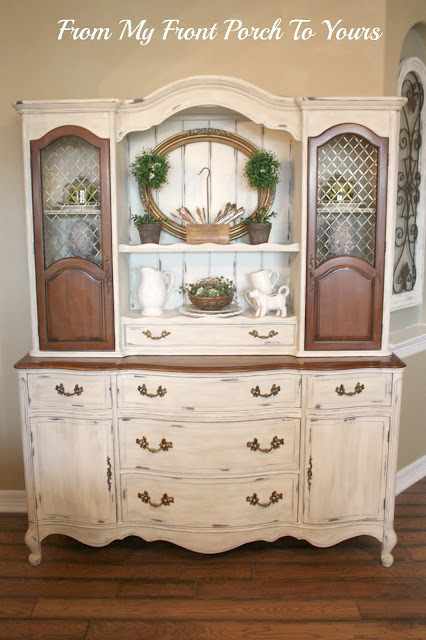 Beautiful job on the hutch, it is just gorgeous and such a good paint job too. Wouldn't have thought to leave the doors the wood color, it looks good. You did such a fantastic job! I love how it is decorated. Wow Pamela - that turned out awesome. I love how you left some of the original wood pieces. Good job! Pamela, this looks amazing! You did an incredible job. It will look wonderful in your dining room. This is FABULOUS! Thank you for sharing. This piece is just stunnin! I love the dorrs in the wood. You can't go wrong with this piece. Pamela so glad your gonna keep that one it is simply beautiful can't wait to see it in your dinning room. Pamela, you did such a great job! It is beautiful. Taking the shelf out (for taller displays) and leaving some wood parts was great thinking. I really like the bench at your table as well. Beautiful job! Your hutch is just lovely. You were right about the shelf :) Thanks for sharing. Visiting from Between Naps on the Porch. You did a fantastic job ~ it is gorgeous!!!! Pamela...that is absolutely gorgeous...you did a magnificent job...I love how you left some of the original finish...Truly a stunning piece! I think taking out the shelf was a stroke of genius! Thin of all the great seasonal displays you can do! I love what you did here. Very nicely done! Love your decorative items on it too. I have to believe it's going to look sensational in your dining room. Love the empty frame..kind of like a large platter but not! I'm here from Blogtalk and no problem with the speed of your loading here and I have a slow internet connection being in the country. What a great hutch. Love it. I too am looking for some French pieces to paint. Wish me luck. Gorgeous! 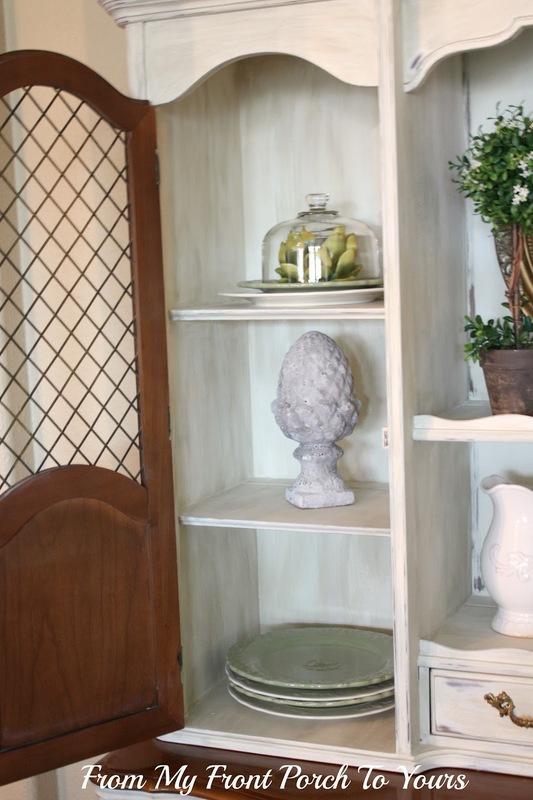 Now you have me rethinking not painting my almost identical hutch/china cabinet. I You were so right to remove the one shelf, it makes a great merchandising area. I can't wait to see it all put together in the dining room. Hi Pamela, this looks so beautiful. You did a wonderful job. And the finished piece looks amazing. Great after picture too. It is beautiful!! The combination painted and stained look is great! Can't wait to see it in the dining room. Pamela, this is stunning! I love the wood combined with paint! Amazing! PS -- I am going to share your link on FB! Everyone needs to see this! This is absolutely gorgeous - leaving the doors wood was a fabulous idea! W O W, what an amazing piece of furniture - great transformation!! Well done, Pamela! Gorgeous, and your styling knocks my socks off. What a show stopper! Fantastic! I see these pieces at the Salvation Army and goodwill and can't see what you did! Great job! What an AMAZING makeover! I have pinned this. I would love for you to link up this wonderful post on Friday's Favorite Pin! I absolutely adore how you kept some of the original wood in such unexpected places. Really adds a warm country feel to the piece. Featured you on Friday Finds today, Pamela! What a great piece! Diffidently a fabulous refinish! Great job! Turned out beautifully! Love what you did. And I think it looks great with the shelf removed...adding that frame was perfect! Of course it will look terrific in there!!! It's gorgeous Pam...I like the contrast of cream and wood grain. Very french looking. You'll have so much fun doing it up for the holidays. Your house is so pretty! Holy Cow! Pamela this is gorgeous! Great job! Love it! What character! So lovely! I love it painted. Good job!! I am your newest follower. I hope you can visit me sometime. Also I would love for you to come by and link this up to my linky party called Rustic Restorations Weekend. Id love to know the steps in creating this look. I have a very smilar piece but I am overwhelmed just by thinking about how much work it will be. I LOVE LOVE LOVE what you did with this piece and I'm going to be on the lookout for something similar. Thank you for the inspiration. Simply charming and beautiful! I love it too! I love the way you left the doors wood and painted the rest of the cabinet. If you want another change down the road you can then paint the doors too! Love, love, love it! 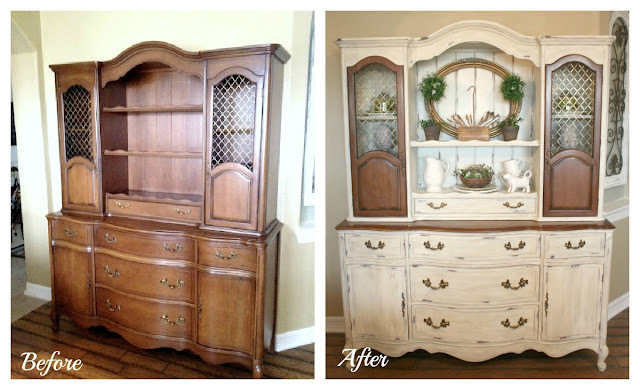 You really did a great job redoing this piece! Beautiful! I have to ask, though, how did you remove that shelf? Did you take a hammer and just bang it out, then putty up the holes? I have a similar cabinet I would like to try this on. You really do have an eye for things. It was such a great idea!